[Source: Adam Kress, Phoenix Business Journal] — A new read on the housing market shows Phoenix home values have dropped nearly 31% in the past 12 months — the steepest decline of any major city in the nation. Home prices across the country fell in August for the 25th consecutive month and prices in 10 major markets plunged a record 17.7% from August 2007, according to the S&P Case-Shiller Home Price 10-city index. From July to August, prices dropped 1.1%. The 20-city index marked a record year-over-year decline of 16.6% with a 1% fall from July to August. The hardest hit of all 20 cities on a year-over-year basis was Phoenix, where prices plummeted 30.7% during the past 12 months. Las Vegas prices plunged 30.6% and Miami sank 28.1%. The cities that held up the best were Dallas, which saw a decline of just 2.7%; Charlotte, N.C., down 2.8%; and Boston, off 4.7%. No city showed a price gain during over the last 12 months. From July to August, San Francisco saw the biggest price decline, down 3.5%. Phoenix prices fell 2.9% and Las Vegas homes lost 2.4% in value. Two cities showed gains in August. Cleveland prices rose 1.1% and Boston prices inched up 0.1%. The S&P Case-Shiller indexes compare the sale prices of the same homes year-to-year and are considered one of the most accurate home price gauges. 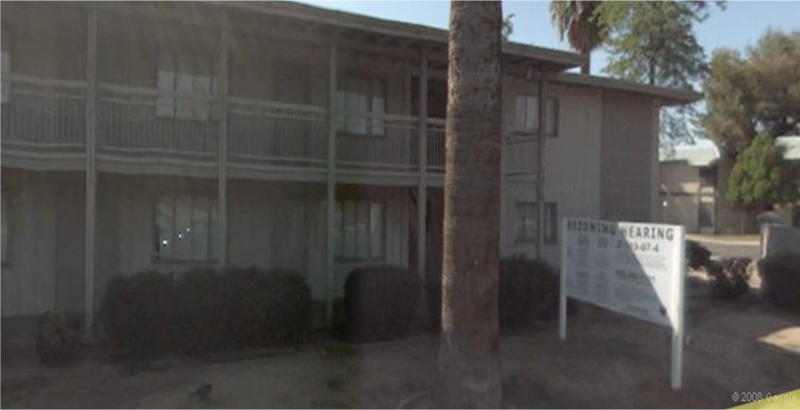 [Source: “Apartment vote delayed,” Kristena Hansen, Arizona Republic] — The saga continues for the redevelopment plan of a shabby apartment complex on Seventh Street in central Phoenix. The Phoenix City Council this month postponed a vote to give the developer and the residents of nearby historic neighborhoods more time to negotiate. The final vote has been set for Dec. 3. “Continuance was in everyone’s best interest,” said Dean Miller, spokesman for Husk Partners, who represents the residents, including those who live in La Hacienda Historic District and North Country Club Drive neighborhoods. Councilman Tom Simplot, who represents the area, mediated several private meetings between the developer, Country Club Homes LLC, and the residents. But they were unable to come to an agreement on stipulations in the Planned Unit Development proposal. Residents agree the current 1950s Country Club Apartments, 3030 N. Seventh St., are an eyesore, but fear the proposed PUD of mixed-use buildings will threaten their quality of life.